Ultimately, there is no wrong way to have a Destin vacation. However, narrowing down the many attractions can be tough! Here are four of the top attractions that visitors to Destin love. The jetties near the Destin Pass were originally built for very practical reasons. They protect Destin Pass, but they have also become an artificial reef in an area where coral reef is largely unavailable. Part of Destin's appeal, particularly for families and swimmers, is that the ocean floor is almost exclusively soft white sand. If you're an avid fisherman, snorkeler or diver, however, you might know that these conditions aren't going to attract as many fish. The East Pass Jetty, while manmade, replicates a reef. That means that it is home to a whole underwater ecosystem, making it one of the top places for fishing and snorkeling in the Florida Panhandle. At high tide, the waters surrounding the East Pass Jetty are crystal clear. Although you can technically access this from the coast, a boat charter in Destin FL allows you to avoid the crowds and seek out the best snorkeling spots in the area. It wouldn't be a trip to Destin without including some time at Crab Island. When the East Pass was created by the U.S. Army Corps of Engineers, all that dredged sand had to go somewhere. The result was what we now know as Crab Island. Today, it's a popular anchorage spot, and it has become a kind of gathering place that represents the fun and spirit of Destin. There are plenty of ways to get to Crab Island, including man-powered vessels like kayaks. However, the most enjoyable option for the day is definitely through pontoon boat charters in Destin. You'll get there quickly, and then you'll have a fun spot to enjoy the day in a great environment. At Crab Island, expect live music, floating stages, a water park for kids and even vendors that float by and offer drinks and snacks. The Destin Harbor Boardwalk stretches for one-quarter of a mile along the waters of Destin Harbor. If you're planning to spend any time on the water while in Destin, there's a good chance you'll also be on or near the Boardwalk. However, the Destin Harbor Boardwalk is not just a place where boat tours depart and luxury yachts are moored. It is also a lively destination packed with shops, bars, restaurants, and more. Whether you want to kick back with a drink and a meal after a day on a pontoon boat or you're shopping for souvenirs, visiting the Destin Harbor Boardwalk is definitely one of the top things to do in Destin. The Henderson Beach State Park is one of the most beautiful and most popular beaches in the region. If you're looking for a romantic spot with amazing views or even an epic place to build sandcastles with kids, this is the spot. Since the beach is so sprawling, even on busy days it is easy to find a less crowded spot. Head into the clear blue waters for a swim, or keep your eyes peeled for shells hiding in the pristine white sand. 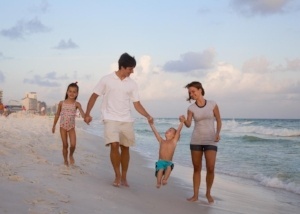 There is no shortage of options for things to do when you visit Destin, Florida. Don’t stay tied to the beach all day every day. Take a break and check out some of the other great things about Destin. To get the best bird’s-eye view from the bay waters, charter a double-decker pontoon boat. Double Fun Watersports in Destin has the newest, double-decker boats for charter and they have two waterslides to boot. Check availability now and charter a double-decker pontoon for your group on your trip to Destin.